Eating fast in Florence can still mean eating well and having authentic local fare - and at good prices. Many people choose to just grab a quick bite at lunch time rather than have a lengthier meal at a proper restaurant. 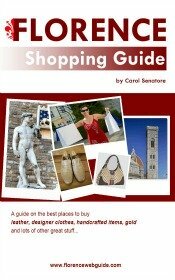 This is a great idea because it gives you more time to explore the city and there are lots of good places in downtown Florence for fast eating. Don't just pop into the first coffee bar or sandwich shop you see - please! The places I tell you about have been set up for locals who work in the area and need to have something quick at their lunch break. This guarantees that the food is good - tourists come and go but Florence residents keep coming back, so these grab-a-bite places want to keep their customers! Read below for the best places for eating fast in Florence at good prices. opening times: from 9 am til "they run out of bread" (usually around 7 pm). 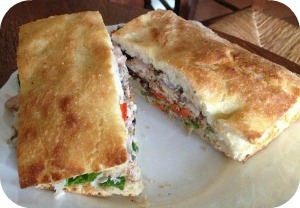 I Due Fratellini is a little nook of a store where you can buy freshly-made sandwiches. 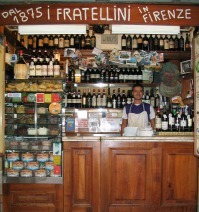 This sandwich shop is an institution in Florence - it goes back to 1875! I couldn't begin to imagine the number of sandwiches that are made every day in this tiny stand the inside of which can only hold the 2 people who work behind the counter. Unlike so many sandwich shops in Florence that sell pre-prepared sandwiches, here they make your panino to order on-the-spot with bread baked daily. You can choose from a selection of over 30 types of filling (Tuscan cold-cuts, Florentine roasted meats, vegetarian choices, etc.) for €2.50 per sandwich (€3 for sandwiches with 'tartufo', truffles). It's handy to know about this food stand because it's so centrally located, right off via dei Calzaiuoli. You can easily just pick up sandwiches in the morning to eat later at lunch time in a piazza or a park. This is also a good idea if you want to save time, since the closer you get to lunch time, the longer the lines are at this sandwich shop. Also, wines by the glass.